Further Warning: This review has been identified to potentially trigger rage in people with ‘All Caps Sensitivity’. Reader discretion advised. It’s pretty much what all of us suspected would happen, but were still scared in case the show/GRRM were trolling us. Jon Snow is revived/resurrected/R’hllored at the end of episode two, *cue flailing/crying/happy dancing*. I was 99.99999% certain this would happen but when the scene takes place it’s such a relief. I had to re-watch it a couple of times to confirm that they actually did it. I also had to hold my breath through the entire credits too to make sure that Olly wasn’t hiding out in the shadows to put a knife back in him or for the R’hollor magic to false start or something equally awful, but no, it does seem as though he’s back for real. Whether that’s as the Jon Snow who we all know and love or as some kind of Night’s King Exterminating Azor Ahai™, we will have to wait until next week to find out. What this also means of course is that so many questions about Jon Snow’s character are being raised, but rather than contend with those in this review, it’s worth checking out Matt Geary’s feature which goes into a bit more detail about why Jon needs to be alive. Okay now that’s the main talking point dealt with, there was still a lot to love about ‘Home’ which puts it in my top ten episodes of the show so far and the 3rd best rated episode on IMDB. The episode starts with Bran and The Three-Eyed Raven in flashback/waking dream mode at Winterfell. It’s been two years in real time since we’ve seen Bran and physically the actor playing him has changed so much. It would almost be a distraction if we weren’t being shown so many plot Easter Eggs in just one scene. We get young Ned Stark in sword practice with his brother Benjen, young Old Nan and a talking Hodor(! ), whose name is really Willis. 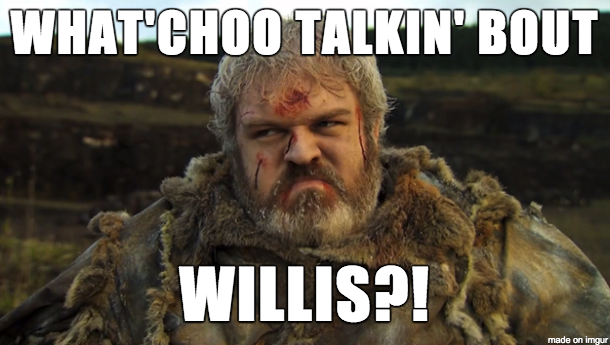 Not much because all he can say is ‘Hodor’. Amirite? We also get an alive Lyanna Stark reminding us heavily of Arya in Season One (sob!) and clearly foreshadowing future events to come. Given that the preview for episode 3 ‘Oathbreaker’ seems to show some scenes at the Tower of Joy we will surely be seeing Lyanna again soon, which means further big plot revelations are imminent. Most people will have heard of the biggest fan theory out there about Jon’s real mother, but it may be that we find this out sooner than any of us could imagine. R + L= J Confirmed? There’s also a nice bit of exposition involving Meera and one of the Children of the Forest at the end of this sequence. Most of what this scene does is remind us that Meera (Howland Reed!) exists and promises that she’ll have stuff to do in future episodes, but it also means we’ll be seeing Bran away from Bloodraven’s cave soon. In what form is anyone’s guess, but it does raise a lot of questions about his role in the war to come. At the Wall we’re reaching the end of the line for Davos, Ghost and the Jon loyalists until Wun-Wun and the Wildlings (future band name dibs) make a timely intervention. The best part of this scene is seeing the entire Night’s Watch ‘nope’ instantly out of the fight as soon as they realise what’s going on. I also can’t wait to see Alliser Thorne’s face (and the incoming memes) when he’s confronted by the newly resurrected Lord Commander Snow. Longclaw will be back in action and swift Stark justice to be had for Jon’s assassins. Back at King’s Landing we have more guards hoping they don’t have to face off against monsters: a mourning Cersei and the wonderfully protective Ser Robert Strong. There’s some great scenes here too. Tommen is afraid that the High Sparrow will put Cersei back in the cells if she attends Myrcella’s funeral. He also blames himself for not stepping in and putting a stop to the High Sparrow before it happened. Jaime is perceptibly warmer with Tommen than he has been in the past which is a good change for his character. I’ve been quite concerned for Jaime since the show diverted away from his book character arc, but I’m interested in seeing where they take him and for what will happen with the High Sparrow and the Faith Militant. Will it be a showdown with the Lannisters? Back at the Red Keep, Tommen reconciles with Cersei and we start to see a new and perhaps chilling dimension to his character too. I highly doubt Tommen will be a Joffrey clone, but there seems to be more to him now than just being a pawn for Cercei or Margaery. Over the Narrow Sea to Meereen, we’ve also got a contender for second best scene in the episode when Tyrion decides to meet Dany’s dragons, Rhaegal and Viserion and set them free. 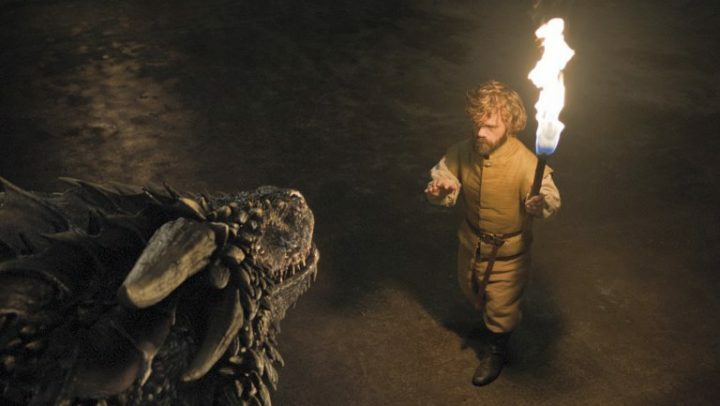 Tyrion has a touching (and frankly terrifying) scene where he releases the dragons from their shackles and recounts how he wanted to own a dragon as young boy. This is the first time we’ve really seen anyone other than Daenerys be close to her dragons and live to tell the tale. The fact that the dragons seem to understand Tyrion’s intentions and let him touch them also feels like some serious foreshadowing for future events (oh hai secret Targaryen!). 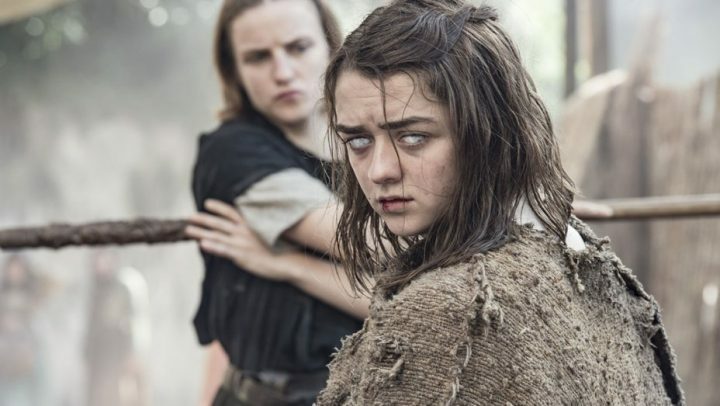 Over to Braavos with my girl Arya, there’s still not much is happening really. She’s still blind and still inexplicably having the crap beaten out of her by The Waif. As my favourite character in the series I’m really hoping she gets to do something soon as I’m finding her current adventures a bit of a drag. I’m still holding out that Mace Tyrell is still in Braavos and she can find her way back to Westeros soon. A Stark reunion is well overdue. Back up North and to Winterfell and Ramsay ‘Mad Dog‘ Bolton is in contention for King Joffrey’s crown as the most hated character in TV history. I haven’t had to watch Game of Thrones through my fingers since we last saw Oberyn Martell take far too long to kill The Mountain, but I definitely had to do it this episode. Ugh. First off though, the scene with Roose Bolton getting stabbed was a brilliant flashback to The Red Wedding when Roose killed Robb Stark. 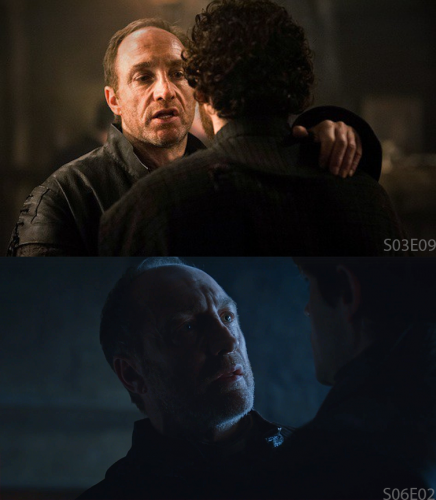 At first I thought it was Roose doing the stabbing now that he didn’t need Ramsay as an heir, but it seems that the showrunners are intent on making the younger Bolton the big bad of this season and so we see him dispatch his dear old dad instead in an act of some serious kinslaying. Personally, I thought this was a waste of such a great character. Roose was one of the major players in the Game of Thrones up until now but his death this episode is yet another sign that the pace for this season has been upped significantly. In his first act as ‘I AM LORD BOLTON‘, Ramsay wastes no time in dispatching his mother Fat Walda and his newborn baby brother – no clever gifs here – in what was honestly one of the worst atrocities to happen on the show even if we didn’t see it directly. Big props to the sound design team who were able to conjure up the stuff of nightmares even though the camera cuts away from the carnage. Hopefully far, far, far away from Ramsay we visit with Sansa and Brienne who speak of Arya and how they plan to go to Castle Black to reunite with Jon, unaware of course of all the events that have been happening there. They also part ways with Theon who says that he wants to go ‘home’. Whether that’s the Iron Islands or Winterfell, I really just hope Theon gets a chance for further redemption and maybe some revenge. It would be great to see him to be the one to kill Ramsey for example. And so to the Iron Islands we go after not seeing much of them at all since season three. Theon’s father Balon and his sister Yara argue over military action in Westeros. 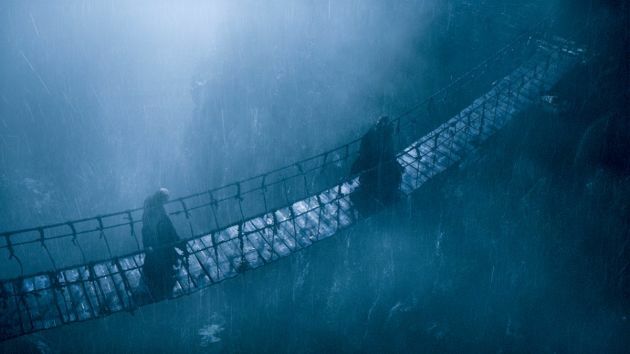 There’s much disagreement (and forshadowing) until Balon storms out only to run into his brother Euron Greyjoy on a precarious rope bridge connecting two towers. I am the storm, brother. The first storm and the last. Balon is also swiftly done away with (something the show seems to have no problem doing this season) by Euron who quickly, it seems wants to be in contention with Yara for The Salt Throne (book readers: Salt Throne = Seastone Chair). Why anyone really wants to rule a few islands with little resources is beyond me, but Yara seems to think they have the best fleet in Westeros so maybe that has something to do with it. The Greyjoys played a significant part in the books, so here’s hoping the show can do a better job with them than they have with the Dorne plot-line. And then we come full circle to The Wall and Jon’s resurrection which I’ve already covered off. I have nothing else to add here other than just how brilliant it was and I still can’t really take in that it’s happened. Welcome back Jon, you were missed, but not really, because we all knew it was a fake out. Next episode ‘Oathbreaker’ – who is the gift? 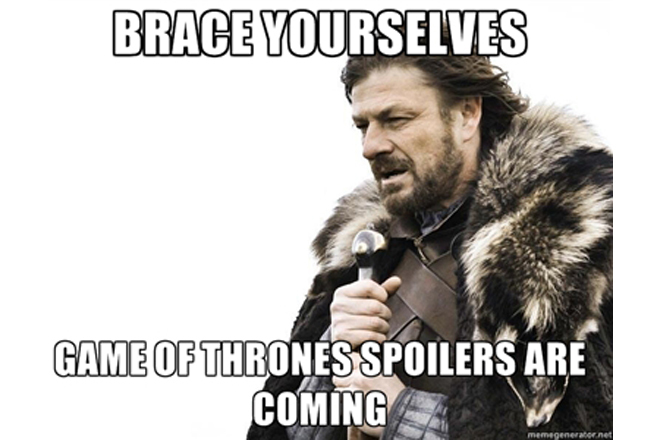 Please don’t be Rickon or Theon or Stannis. Is it Stannis? Lianne's superpower is stating the obvious. She's a professional Photographer and a mum to two young boys. Her lifetime goal is to be adopted by Liam Neeson.